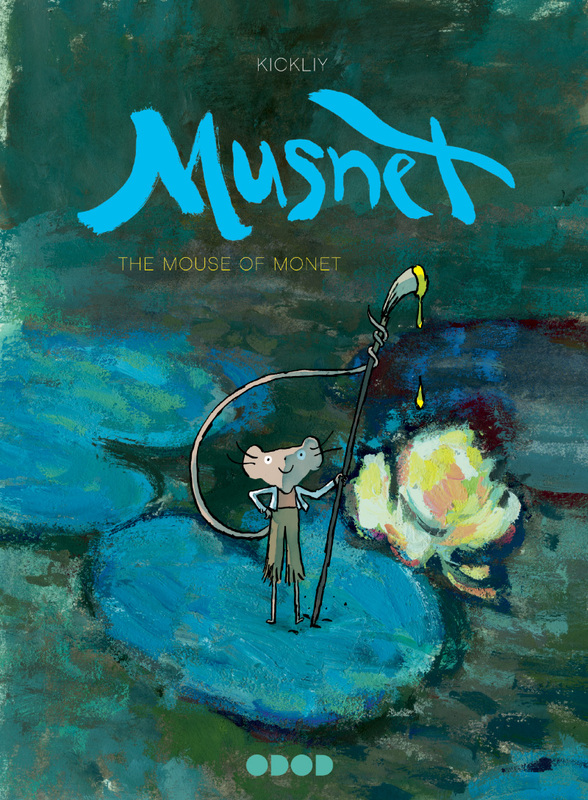 Review: Musnet: the Mouse of Monet, Vol. 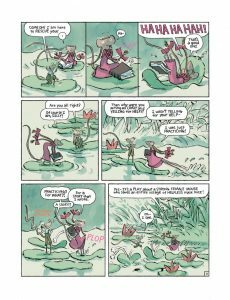 The first half of the ODOD Books Kickstarter package came this weekend, and I immediately started in on the headline series, Musnet: the Mouse of Monet. 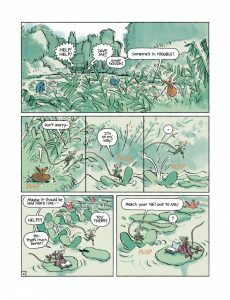 Nominated for the 2017 Prix Angoulême in the Youth Category, the series has been picked up for English publication by Uncivilized Books through their ODOD children’s books imprint. 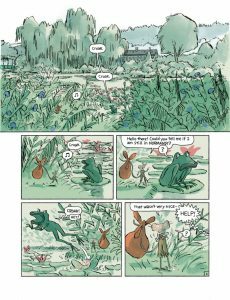 Set in late 1800’s France in the northern region of Giverny, Musnet is the story of a small peasant mouse without a father, mother, or even a name who is out trying to find work. With the help of another young mouse named Mya, our little friend falls in with a geriatric painter squirrel, who promises to teach him to paint in exchange for cleaning his studio and preparing his paints and supplies. The main character also goes through a process of self discovery and gives himself the name Musnet. The format of Musnet: the Mouse of Monet is like many French bande dessinée hardcovers, a relatively short comic with lux construction. These books are very nice – your Kickstarter dollars hard at work. The first volume of the series is 56 pages but 8.5”x11.5”, so Kickliy has plenty of space to play. 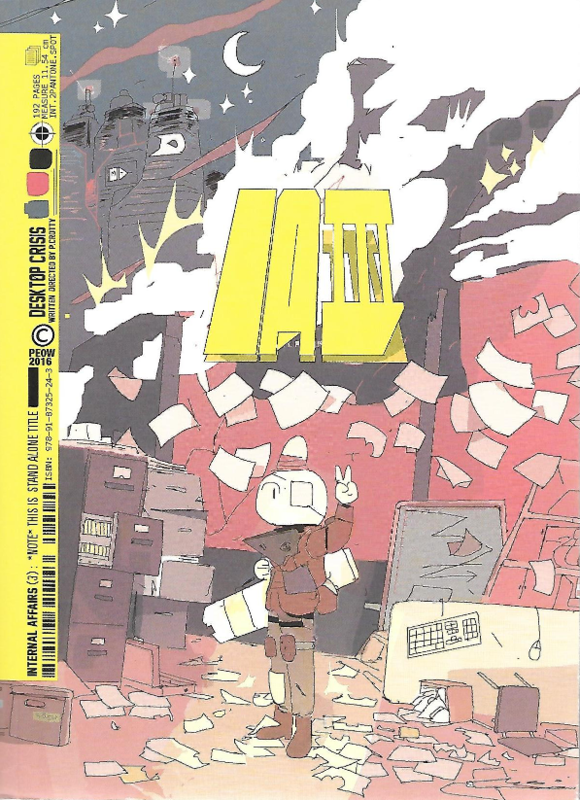 And play is a good way to talk about this first issue of Musnet – while warnings about the dangers of snakes, owls, and cats are everywhere, this is mostly a carefree comic. Our little mouse friend practically floats through the one dangerous situation he gets himself in, with no whiskers out of place. We’ll see how Kickliy works with the constant danger of mouse life in subsequent volumes. As if the title didn’t give it away, the characters in Musnet: the Mouse of Monet live in the world of famous French Impressionist painter Claude Monet. The small family of mice that Mus spends his time with live in the home of Monet as he paints. Musnet even gets some of his painting supplies from the drips and drops on Monet’s studio floor. The setting allows Kickliy to reconstruct in miniature some of Monet’s work, and the reproductions are lovely. 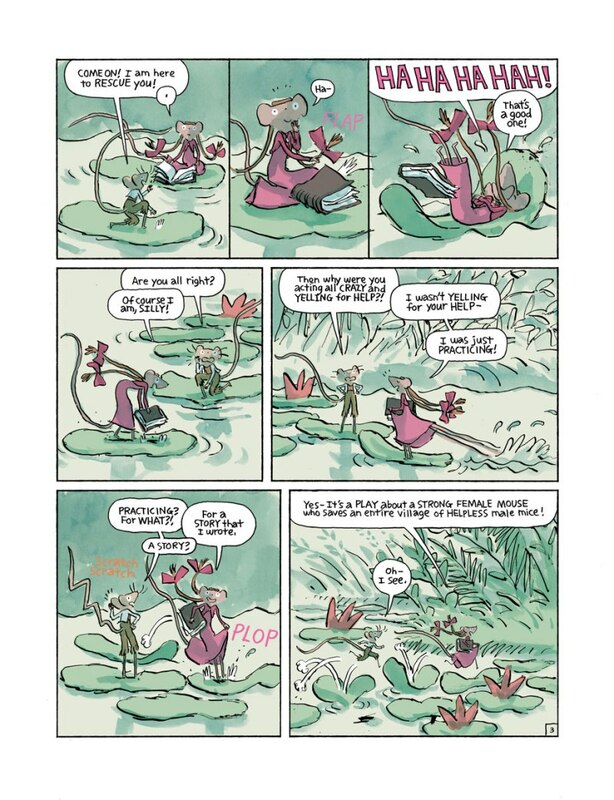 I’m not as studied as I should be in my art history, so I can only speculate about whether all of the art in these comics is Impressionist inspired, but what I can stay is that the colors of Musnet: the Mouse of Monet are absolutely stunning. Kickliy’s watercolor and ink drawings are really lovely, and the characters are vivid and fun. The rodent characters are wiry and have a liveliness about them, and multiple times I was reminded of the illustrations of Quentin Blake. Along the way, Kickliy also sprinkles in some of the basic concepts of oil painting, teaching readers about how canvases are made, how paints are mixed. 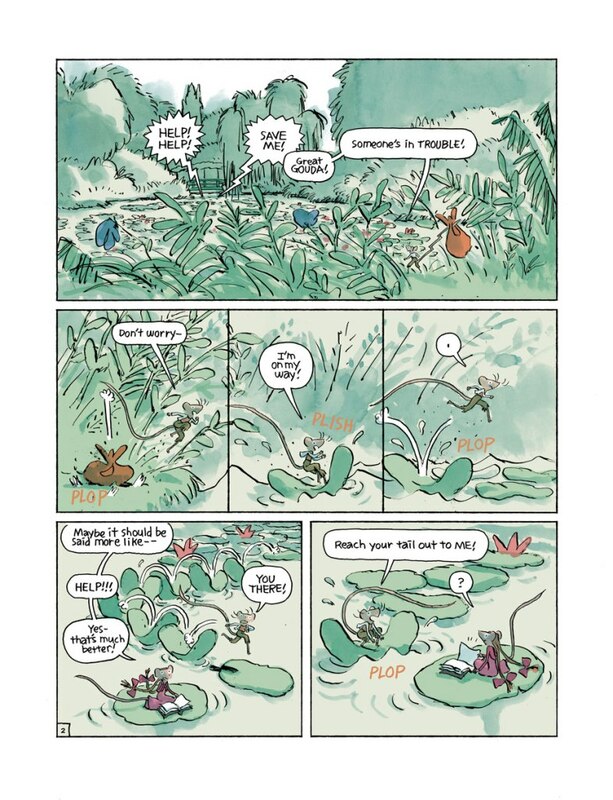 Kickliy doesn’t lecture readers, Musnet is not “educational comics,” but small things like the words impasto and filbert are naturally mixed into conversation, which encourages readers to do a little extra learning. These comics seem perfect for the 8+ set, but I found the book very enjoyable as an adult reader, and I would expect adult readers for younger kids would find a lot to like. Musnet: the Mouse of Monet is an fun and funny adventure comic that subtly introduces young readers to French Impressionist painting, and perhaps to art as an active pursuit. I’m excited to share these comics with the young readers in my own family. Sequential State has a Patreon – if this reading experience was worth a dollar to you, please pledge your support. I want to build a better comics community by paying other critics to write and by hiring cartoonists to create work for the site. Your support makes those goals possible. Thanks!